hybrid motor >> h22a1 head .. h23a1 block .. h23VTEC ..
full spool by 3900 rpm ! what do you guys think about that torque ? Last edited by street_ride14; 06-25-2010 at 11:04 PM. looks pretty good, what do you think you can hit on the track? Sick! Pics and videos now!! I would say your only option on street tires would be boost by gear. Last edited by street_ride14; 06-25-2010 at 01:41 PM. yeah this is sick man.. those are awesome numbers and you went quality too with the parts and everything.. very nice good luck at the track! Spinning tires in third on the highway.....shhiiit. I want me some of that. why do the dyno numbers differ between different dyno testers your slip shows 29? and you say thats 35? on a dyno jet how the f! @k do you get dif numbers? so whos doing the real true power tests because i see no point in the test if there not uniform to other test. and are you trying to say that as you car is aproching redline in third gear its spinning the tires or when you shift to third your spinning? are you trying to say that as you car is aproching redline in third gear its spinning the tires or when you shift to third your spinning? Last edited by street_ride14; 06-25-2010 at 10:04 PM. why do the dyno numbers differ between different dyno testers your slip shows 29? and you say thats 35? on a dyno jet how the f! @k do you get dif numbers? so whos doing the real true power tests because i see no point in the test if there not uniform to other test. Second of all there are a few different types of dynos that all put out different numbers because of the way they measure power. Dynojet, Mustang dyno, Dynamics, etc... Dynojet is the most accurate and the universal numbers that people compare to. Dynamics and mustang dynos read anywhere from 10%-25% less than the dynojet. They each have their benefits, for ex Mustang dynos are known to be easier to tune on. Last edited by Adrenaline; 06-25-2010 at 10:16 PM. nice build, thats alot of boost for a stock block isnt it? Dynojet is the most accurate and the universal numbers that people compare to. Last edited by street_ride14; 06-25-2010 at 10:35 PM. DynoJet is NOT the most accurate, but IS the most talked about and compared to. Im used to RWD guys that all they use is dynojet. And what ive heard is dynojet measures high, and the others usually measure more usable power. Right? Last edited by street_ride14; 06-27-2010 at 10:28 AM. thanks for the dyno info im from noth mi. and i dont think a dynos even been discovered up here yet. so i dont have alot of experience with them. or any for that matter. 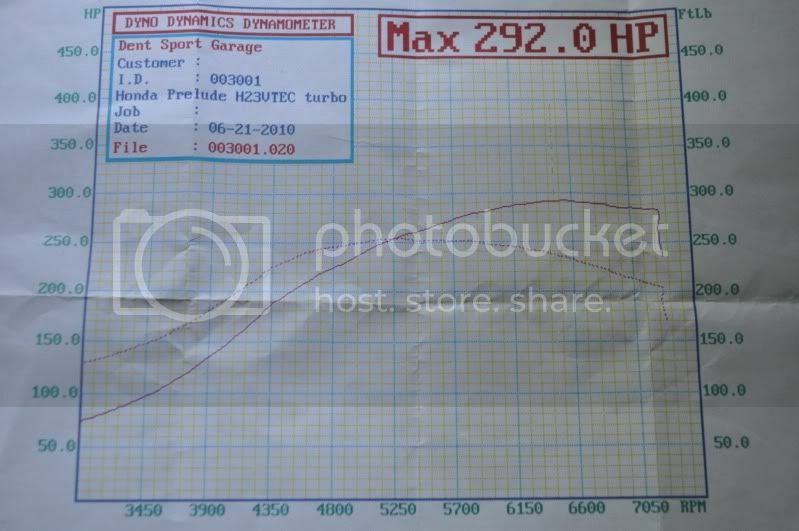 Those are pretty decent numbers especially for a dyno dynamics and stock bottom end! Please don't take this the wrong way but I honestly would have expected to see more from this. I have a long history with the H series and maybe I'm missing something but that turbo should have spooled way sooner and made much more power at that boost level. I know you said the timing wasn't touched much but perhaps that's the issue. Do you run with an EGT gauge? If so what's the EGT at during full throttle? Also with a spool like that you might want to check for boost leaks. The backs of the compressor covers leak pretty bad. Most older journal bearing turbos don't have on o ring seal that goes in between the compressor cover and the seal plate like a lot of t3 framed garrett ball bearing turbos do. Check that stuff out and good luck. Yah I heard those r more accurate than dynojets. 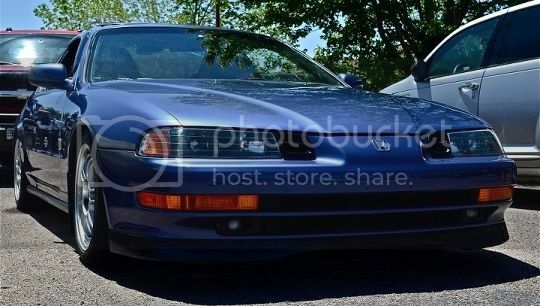 Isn't your lude packing over 400 horses? this is the first time ive ssen the spoolin performance manifold. im pretty stoked i saw it because ive been looking for a decent manifold to keep my ac in my 5 gen, i was just about to just say f-it and get a neukin qp manifold i guess my question for u is how did u like the welds on the sp4ac manifold? have u had any problems with craxking or installation with the wastegate? r u useing a v band or a reg. 4 bolt design...?? ur setup looks good. i like. Spoolin' Performance has two 'Quick-4' manofolds.. one to be used without AC, and one eitherway. My AC is elimintated so I got purchased this one, they are almost identical-just the T3 flange is welded at an angle with the AC-compatible manifold. The welds look great, but I was not expecting anything less or of poorer quality from Spoolin' Performance, they are really good at what they do. No cracks or issues since purchase and installation in June of this year. I am using the 4-bold design, but you can get v-band welded on by preference if you choose.